I’m always looking for interesting new communities to highlight on opensource.com. Over the past year, I’ve covered everything from Wikipedia to OpenIDEO to The White House and am, frankly, overwhelmed by the sheer quantity of new community-building efforts going on out there. Seems like every day I get an email or see something on Twitter or Facebook about a new community that sounds interesting and innovative. I’ve found some amazing people and visionary ideas. I hope to continue to highlight the best of these new communities here on the business channel. But at the risk of sounding like a hater, I must admit I’m getting a touch of new-community fatigue. 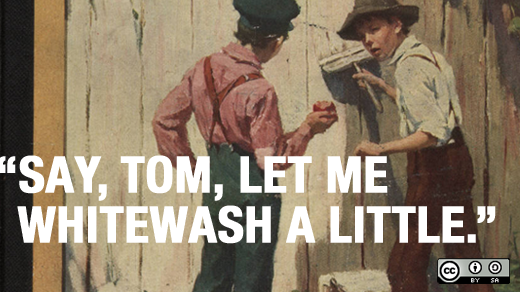 After playing hooky from school on Friday and dirtying his clothes in a fight, Tom is made to whitewash the fence as punishment on Saturday. At first, Tom is disappointed by having to forfeit his day off. However, he soon cleverly persuades his friends to trade him small treasures for the privilege of doing his work. It seems like many people approach community strategy with this Tom Sawyer thinking (see: crowdsourcing). How can I get people to paint my fence for me? Why is the default reaction of most people and organizations usually to create a new community with them at the center? Why instead don’t more people look for and join a community that already exists with a purpose or goal similar to their own? So this post goes out to the painters, the underappreciated folks (the open source world is full of them) with enough humility join communities started by others rather than only being willing to participate in communities centered around themselves. If more people thought this way, perhaps we could help get everyone’s fences painted. « User-led innovation can’t create breakthroughs. Really? Chris, I have a client who is dealing with this same issue as I type this. I think it’s a great point. Companies who want to reap the fruits of social communities need to get out there and put in a little time in the communities themselves. Think service first. It’s not that hard, and who knows what you’ll learn and who you’ll meet. I don’t have a problem with someone starting their own community — but it has to be service oriented, not self serving.